Those of you who know me and those who do follow my blog, should know by now that I like gardening. Ok, maybe I don’t like gardening (i.e. weeding etc) itself but I love to grow things especially flowers. I went into the garden today and noticed my tulips!! The pot was hiding behind the rabbit hutch so hadn’t noticed them until now! I just had to share the photo as I think they look lovely. Thankfully they have been spared by the rabbit!! He probably doesn’t like the taste. 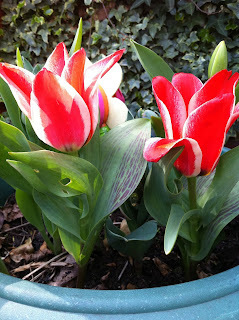 The good thing about tulips is they will grow every year so I have them to look forward to next year aswell inshAllah! The tulips look beautiful masha'Allah.